Hello, fellow oddience. I was working on a project for some time with 2 more people. 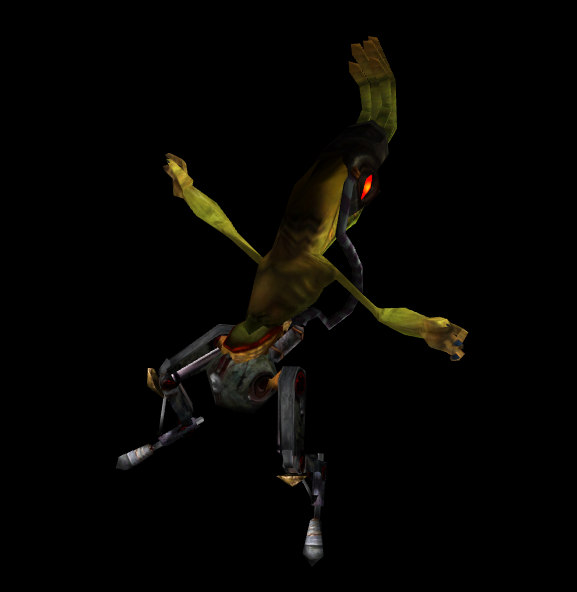 That project involves converting the models and animations from Munch's Oddysee for use in source games.. specifically - Garry's Mod. After searching for any scrap of information on the internet, I could only find out that the .kf files (which are the animations for each character) are too old for Nifskope to open, but the .nif files (models) are totally fine, all characters are possible to view in Nifskope whatsoever. My only guess is that someone could open the anims in a Hex Editor and modify them. So here comes the question: can anyone help out and modify the animation files so that they can be exported to a useable format in Source? I believe somebody already did convert MO models to Garry's Mod, I urge you to check the internet for those. No, I know about the models from way back before when they were on Garrysmod.org, I saw them on workshop as well. I meant the animation files which can't be opened by NifSkope. The only way to do that is to modify them in a Hex Editor, because the version is too old for NifSkope to open. Dunno about NIF files. Does Munch HD also use NIFs? There's no PC version out, I mean the console versions. If so, maybe the NIF version is higher there? I tried to get them from there, but I had no luck doing so. I only managed to extract all sounds and music. Too old for NifSkope? Surely just find an older version of NifSkope then? The latest version of NifSkope is 1.2.0, the oldest I was able to find was 1.1.0, and even so, it's no use. Also, I am no stranger to sarcasm, Varrok. Have you tried to contact the NiSkope creator (or one of those, if there are more than one)? I bet they still have the old versions laying around. Maybe they'll even help you a bit. I've posted a topic here. Let's just hope someone will be kind enough to reply to it with a valid solution. The problem is probably that NIF files and MO predate this tool, and I doubt any version ever properly supported it. It's as I feared. I guess the only way to get the animations within NifSkope is to hexedit the .kf files and maybe even the .nif files. I have no experience with any type of Hex Editor, though..
Edit: I downloaded the newest version of NifSkope (2.0), but I got this error: "this is not a normal .kf file; there should be only NiControllerSequences as root blocks"
Last edited by Sir Daniel Fortesque; 01-27-2016 at 11:10 AM.. If that is true, then why MO PC uses nifs, still? I have no clue, it was just an idea. There's got to be some way to get these goddamn animations, I just can't figure it out. (Sorry for the double post) Someone on NifTools Forum posted a tutorial on how to get the animations to work. It's a little tricky, but it works. He even got the fuzzle animated! This is going to take way too much for just 2 people, a model can be done anywhere between half an hour to more, and there are a lot of models. If you or someone else were to join, we could get them done much faster. Well, I'll try to finish them as quickly as possible and release it to the public via Steam Workshop when the mod is done. Thank you, anyways! Edit: Here are some pics of some anims I've finished. It's gonna take a looong while, at least 12 anims per model. Last edited by Sir Daniel Fortesque; 01-28-2016 at 02:00 PM.. If it can be done manually then why not write some code to automate it? What animations exactly and why? Is it because they look so goofy? Last edited by Sir Daniel Fortesque; 01-31-2016 at 01:09 AM..
is painful to watch for me. More to this story, as it develops! Since they're .nif files could they theoretically be converted for use in Skyrim/Fallout?